Now regular readers will know that I am fond of a bit of good old-fashioned obfuscation. But talking about computational propaganda when what you mean is fake news on social media seems a bit rich. But this is a serious bunch, a dedicated research team within the Oxford Internet Institute, which is in turn a part of the (real) University of Oxford. The group’s website (comprop.oii.ox.ac.uk) details its aims and publishes some of its research. Perhaps surprisingly, given that Collins Dictionary made “fake news” its word of the year for 2017, the project has been running since 2012. It seems academics spotted this trend far before we mortals dis. Fake news is a moral concern for us all, of course. But it is also a major worry for our industry. Newsgathering is expensive, and major broadcasters do it because it is central to their status as a trusted brand. Now they are being taxed with twin threats: unprincipled politicians declaring “fake news” every time a news broadcaster says something unpalatable; and anyone with a Twitter account setting themselves up as journalists and spouting any sort of rubbish. Mark Zuckerberg of Facebook told the Wall Street community recently that profits are about to take a dip because of the soaring costs of keeping fake news off the site. And that is actually quite a challenge. Stand by for a staggering number: Facebook has more than two billion active users. To put that into perspective, the population of the world is 7.6 billion, so without allowing for all those under 13s prevented from getting an account by Facebook’s rules (yea, right), something over 27% of everyone in the world logs on at least once a month. According to a body called The Social Skinny (“a website dedicated to social media and website optimization strategy”) 510,000 comments are posted, 293,000 statuses are updated and 136,000 pictures are uploaded every minute. Other researchers have different detail, but this seems to be around the consensus. So the idea of employing people to sit and read every post on social media is not really a winner, despite the opinions of those same unprincipled politicians. You need some pretty clever big data analytics, with some pretty clever machine learning, if you are going to keep on top of this. Which finally brings me to my prediction for 2018, which is what you are expecting me to write about. 2018 is going to be the year of machine learning. Or, for old folk like me, artificial intelligence. Let me make it clear from the start that, for me at least, there is a gulf between “bots” which apply machine learning to data sets, and “robots” in the traditional sense of the world. 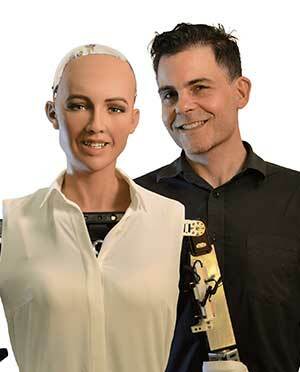 One of the top talking points at IBC2017 was robotics, and the disconcertingly alluring Sophia in particular. This seems to me to be very clever technology, but I am far from convinced that I know what it is for. We are comfortable in dealing with the sound of artificial intelligence, through chatting to Siri and Alexa. But the physical manifestation seems – to me, at least – to be an unnecessary step too far. On a more practical level, the IBC Conference Prize, which goes to the most innovative thinking in the technical papers programme, went to TV Globo in 2017, for a paper called Big data for data journalism, enhanced business analytics and video recommendation. It describes three projects, all of which use machine learning in one way or another. Video recommendation is an obvious application for machine learning. If you have ever bought anything from Amazon, you will know that forever afterwards it will attempt to predict your next purchase. Recommending content to subscribers is the logical extension. But TV Globo is also using machine learning algorithms to trawl through publicly available data, such as government papers and economic resources. Using the cloud grunt provided by AWS, it created what it called a data lake, which then allowed journalists to access the data to understand what was going on. In a test exercise, a typical research project took a week to answer a business question using Excel, and seven seconds using the big data environment. Another pioneer in the field is Amagi, which has demonstrated a system to suggest where commercial breaks should go. This is a real-life and not very stimulating task: content comes in from around the world with different commercial break patterns or none, and someone has to decide where the ads are going when you show it. My oft-repeated principle is that computers are very good at dull, repetitive tasks; people are good at creative tasks. So I asked KS Srinivasan, co-founder of Amagi, if machine learning is going to change that basic principle. “The biggest question that broadcasters would need to answer is ‘do we really need machine learning, and why’,” he said. Which might have sounded a little far-fetched, were it not for a recent interview in Broadcast with Matthew Postgate, BBC CTO. He revealed that, at the Edinburgh Fringe Festival back in August, BBC experimented with using AI in place of a director on a comedy panel show. In what he admitted was a sledgehammer technique, the computer analysed thousands of shows to learn how to direct the relatively formulaic genre. If even directors can be replaced – admittedly only for the simple stuff (today) – then should we all be retraining as machine learning designers? Gartner, one of the heavyweights in technology research, has said not to panic: artificial intelligence may actually create more jobs that it is expected to eliminate. By 2020, it forecasts, artificial intelligence will generate 2.3 million jobs, exceeding the 1.8 million that it will wipe out. In the next five years, to 2025, the net increase in jobs attributable to machine learning will reach two million, according to the report.